Blog: Check out ‘Magic Beach’ at Spanish Banks Low Tide! Check out ‘Magic Beach’ at Spanish Banks Low Tide! We just did this today and it was awesome… When the tide is 1 meter or lower (check tide charts here) Magic Beach will show up at Spanish Banks… I think the name Magic Beach was made up by a lady we met who heads out there as often as she can. About 30-40 mins before low tide head straight out from the dog park at Spanish Banks West (very close to the hill heading up to UBC), and head roughly out to the far channel marker. As you walk further and further out (about 25 mins) you will see a beach forming. The Beach has very different sand than the rest of Spanish Banks, it is very fine and light in colour. The Beach will only show up for about 30-90 minutes depending on how low the tide gets. Today the tide was 1 meter and we sat out on the beach for about 20 mins before the tide started to turn. This was extremely cool and highly recommended on a sunny low tide day… Around noon on Saturday the 13th looks like it could be a good one! 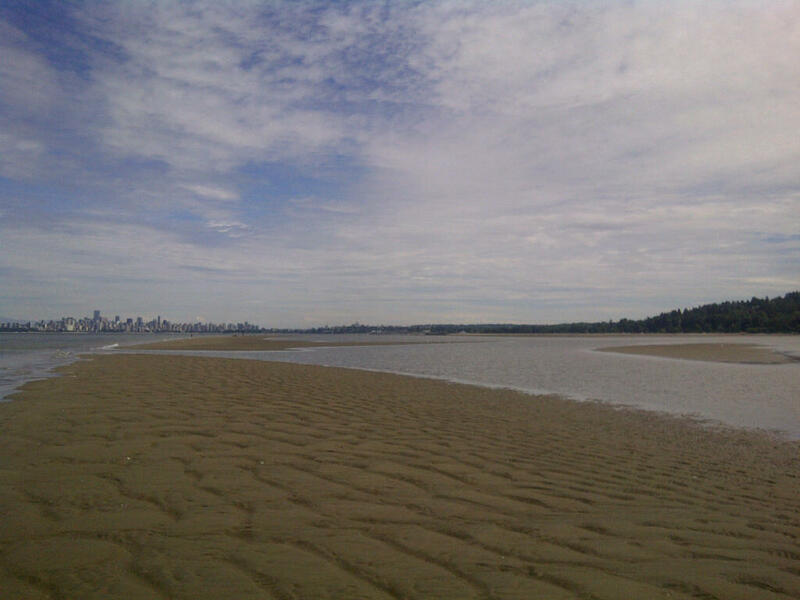 Excuse the crappy photo from my blackberry... you can see Magic Beach on the next sandbar ahead. This also gives you a good idea of how far off the beach it is.